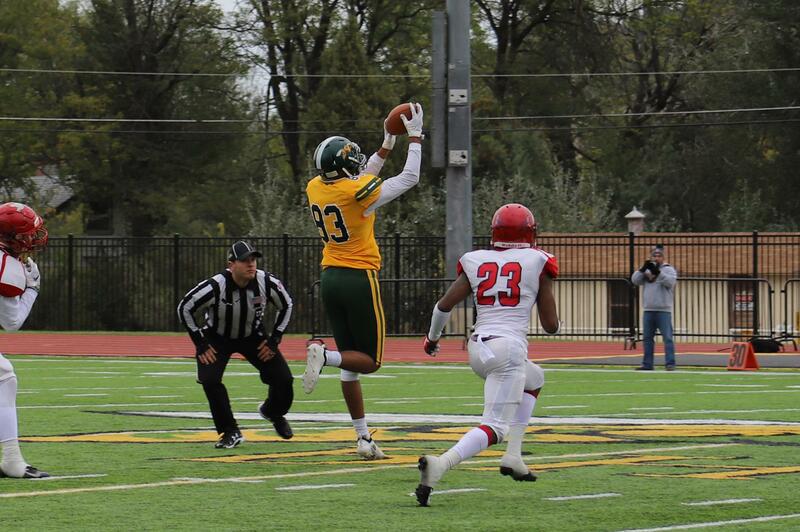 Jordan Pace of BHSU reaches out for a catch. RAPID CITY, S.D. – The Black Hills State University football team fell in the 133rd Black Hills Brawl, 62-14, to South Dakota School of Mines and Technology on Saturday evening. The Hardrockers (3-3, 2-3 RMAC) scored using a seven-play, 45 yard drive to open the game, and never looked back in the rivalry matchup. South Dakota Mines scored on their second drive to lead, 14-0, with seven minutes to play in the first quarter. BHSU (0-6, 0-6 RMAC) got the ball back with 7:01 to play in the first. Ryan Hommel, back in action after missing two games due to injury, marched the Yellow Jackets down the field. He connected with Kielar Harpham for a 16-yard touchdown, and cut the lead down to 14-7. However, the Hardrockers immediately responded, scoring on a 47-yard pass, to go up 21-7, which was the score at the end of the first quarter. Despite BHSU forcing a fumble early in the second, South Dakota Mines outscored the Yellow Jackets, 27-0 in the period, and led 48-7 at halftime. Down 62-7, the Yellow Jackets got the ball with 6:54 to play in the game. Tyler Hammons, who was in the game at quarterback, took the team down the field, culminating in a 6-yard touchdown pass to Jordan Pace. South Dakota Mines outscored BHSU, 14-7, in the second half, and reclaimed the Homestake Trophy with a 62-14 victory. Ryan Hommel threw for 153 yards and a touchdown in his return to action. Tyler Hammons threw for 56 yards and a touchdown. Dylan Reiners led the Yellow Jackets with 73 receiving yards. Pace and Harpham had the two touchdowns for BHSU. Defensively, four Yellow Jackets had double digit tackles. Drew Hebel led the way with 14, while Bailey Rosenstrauch tallied 13. Austin Goodard recorded 12 tackles, and Hunter Stephens had 10. For the Hardrockers, Jake Sullivan threw for 260 yards and five touchdowns. Four different players had receiving touchdowns, and three different players recorded rushing scores. The Green and Gold will look to bounce back at home October 13. The Yellow Jackets welcome New Mexico Highlands with kickoff scheduled at 1 p.m.